Accumulating mutations in cancer cells not only render malignant transformation, but also activate host’s anti-tumor immune response. However, under selective pressure, cancer cells with high immunogenicity are eliminated while ones with low immunogenicity survive. This process is called immunoediting . Dynamically evolving antigen spectrum endows cancer with the capability of immune escape . Apart from immunoediting, other factors such as immunosuppressive tumor microenvironment contribute to immune evasion as well . Cancer immunotherapy is developed to counteract multiple inhibitory immune factors, from impaired cancer antigen presentation to unleashed cancer-killing activity [4–6]. During past few decades, multiple cancer immunotherapies have been successfully applied in clinical practice including oncolytic virus, chimeric antigen receptor T cell (CAR-T), bispecific antibody, and immune checkpoint inhibitor (ICI) [7–10]. Most immunotherapies are aiming to enhance adaptive anti-tumor immunity. Actually, adaptive anti-tumor immunity is highly dependent on robust innate immunity . As the first immune barrier of host, innate immunity could sense non-self-material by various pattern recognition receptors (PRRs) such as cytosolic DNA sensor . Malignant transformation usually accompanies formation of cytosolic chromatin fragments and micronuclei, increasing the probability of DNA leakage in cancer cell or cancer cell-derived DNA uptake by dendritic cell (DC) . 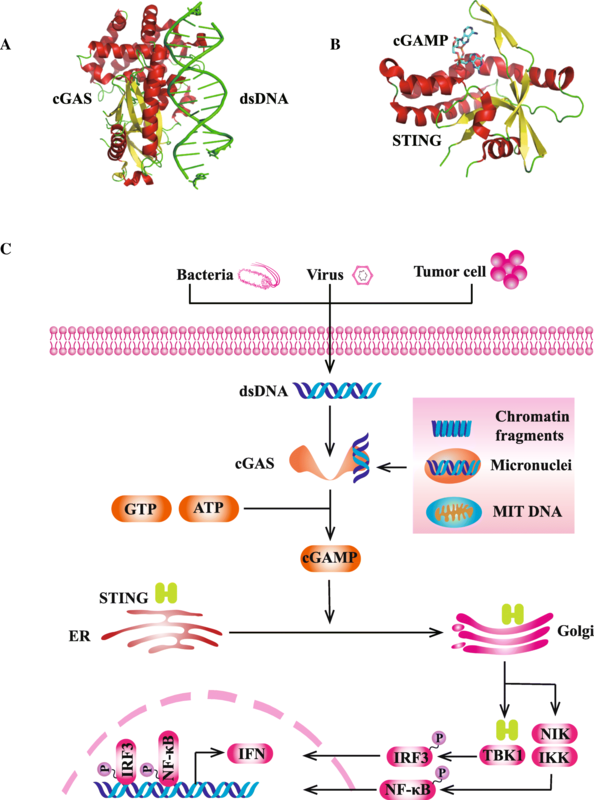 Stimulated by cytosolic DNA, active cyclic GMP-AMP synthase-stimulator of interferon genes (cGAS-STING) pathway stimulates the expression of type I interferon (IFN) in cancer cells or DCs, initiating innate anti-cancer immunity [13–16]. Actually, type I IFN is a versatile molecule related with cell senescence and inflammation response . It has been verified that type I IFN signal is essential to the cross-priming of the tumor-specific T cells . Since STING molecule was found in 2008 [19, 20], substantial efforts have been expended to find an appropriate cGAS-STING agonist for anti-cancer agent development. Actually, cGAS-STING agonists not only induce cancer cell senescence but enhance adaptive anti-cancer immunity which would synergize with immunotherapies [21–24]. In this review, we highlight the latest understanding and the advances of cGAS-STING-targeting strategies, especially in combination with immunotherapies such as cancer vaccine, ICI, oncolytic virus, and chimeric antigen receptor T cell (CAR-T) therapy. STING is a cytosolic DNA sensor anchored in endoplasmic reticulum (ER) [25–27]. STING pathway could not be directly activated by double-stranded DNA (dsDNA). Instead, STING pathway is predominantly activated by second messenger cyclic dinucleotide (CDN) which is generated by cGAS . Cytosolic dsDNA directly binds to cGAS and subsequently catalyzes the production of cyclic GMP-AMP (cGAMP) (Fig. 1a) [29, 30]. Following the stimulation of cGAMP, the conformation of STING molecule is changed from monomer to dimers (Fig. 1b) . Then, STING dimers are translocated to perinuclear microsome from ER via Golgi apparatus . STING could recruit and activate TANK-binding kinase 1 (TBK1) which further phosphorylates interferon regulatory transcription factor 3 (IRF3) and upregulates the expression of type I IFN . In addition, STING could activate nuclear factor kappa-light-chain-enhancer of activated B cells (NF-κB) pathway by binding to IκB kinase (IKK) and NF-κB-inducing kinase (NIK) [32, 33]. Activated NF-κB pathway collaborates with TBK1-IRF3 pathway to induce the expression of type I IFN (Fig. 1c) . Type I IFN has multiple immune-stimulatory functions promoting the maturation, migration, and activation of multiple immune cells such as DC, T cell, and natural killer cell (NK) . For normal eukaryotic cell, DNA is strictly separated from cytoplasm to avoid auto-inflammation . However, in tumor cell, the probability of exposure of DNA to cytosolic DNA sensor increases [37–39]. Even though the mechanisms by which nuclear DNA leaks into cytoplasm have not been completely understood, some factors are speculated to contribute to initiate endogenous DNA sensing . Among these factors, the frequent formation of micronuclei plays a vital role in cGAS surveillance . Due to the characteristic of genome instability, cancer cells usually undergo chromosome mis-segregation during cell division [41, 42]. The lagging chromosomes are enveloped by original nuclear membrane which further forms micronuclei [40, 43]. Micronuclei membrane is easy to break down and results in the release of contained dsDNA . Besides micronuclei, small DNA fragments derived from DNA damage could be released into cytoplasm during the whole interphase which could activate cGAS-STING pathway as well [45–48]. In the context of reactive oxygen species (ROS) response, mitochondrial DNA leakage is another contributing factor to stimulating cytosolic DNA sensor and activating STING signaling . As mentioned above, intact cGAS-STING pathway is the essential competent for host to defend the invasion of DNA viruses, retroviruses, and intracellular bacterial pathogens [95–97]. In the same time, it was found that multiple cancers harbored deficient cGAS-STING pathway such as colon cancer and melanoma [46, 98]. Thus, it is logical to choose oncolytic virus strategy for cGAS-STING-deficient cancer patients . Xia et al. used herpes simplex virus type 1 (HSV-1) lacking γ34.5 gene in mouse melanoma model . The γ34.5 viral protein could repress host innate immunity and HSV-1Δγ34.5 could effectively activate cGAS-STING pathway and clear virus infection in normal cells . However, for cGAS-STING-deficient tumor cells, disabled anti-viral response resulted in rapid virus proliferation and ultimate cell death . It was displayed that melanoma cells with deficient STING were susceptible to HSV-1Δγ34.5 infection . In addition, Barber et al. found that cGAS-STING-deficient mice possessed higher response rate to intratumoral injection of HSV-1Δγ34.5 in mouse ovarian cancer model . Given the frequent inactivation of cGAS-STING in multiple cancers, usually caused by hypermethylation, it would be reasonable to apply oncolytic virus therapy in a subset of patients. By transferring gene encoding CAR, engineered T cell could specifically recognize target antigen on tumor cell with single-chain variable fragment (scFv) domain . CAR-modified T cell is activated independent of MHC manner and then directly kills tumor cell [101, 102]. CAR-T therapy has been successfully applied in hematological diseases, but its effect is limited in solid tumors [103, 104]. It is generally believed that immunosuppressive tumor microenvironment and intratumoral heterogeneity mainly contribute to escape from immune killing by CAR-T cell [105–107]. Smith et al. designed a novel implantable bioactive carrier which could deliver CAR-T cells to the surface of tumors . 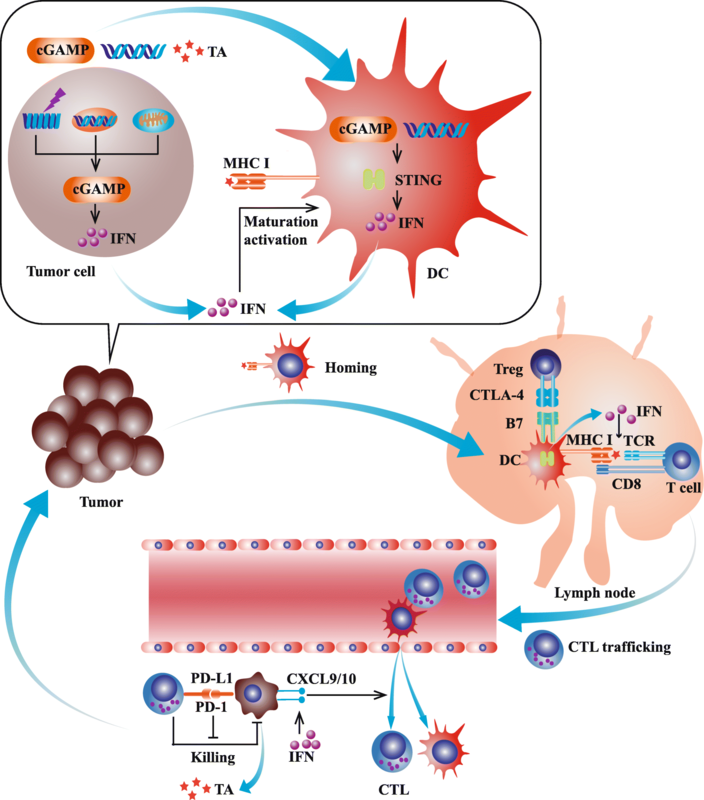 Compared with systemic delivery of CAR-modified T cell, delivery by this bioactive carrier significantly enhanced T cell expansion and tumor control . CAR-T therapy delivered by implanted scaffold prolonged survival time, but the intervention could not completely eliminate tumor in mice . Under selective pressure, tumor cell with high expression of targeting expression (RAE1) were destroyed while RAE1low/negative tumor cells survived . As a result, all mice developed resistance to CAR-T therapy . Then, the bioactive scaffold was modified with additional STING agonist cyclic di-GMP (cdGMP) . Co-delivery of cdGMP and CAR-T cells markedly increased the activation of downstream signaling pathway of the TCR/CD3 and circulating tumor-specific T cells . In mouse pancreatic tumor model, combined delivery of CAR-T cells and cdGMP completely cleared tumor in four of ten mice and significantly prolonged survival time . To further investigate this combination therapy induced systemic anti-tumor immunity, four mice undergoing complete regression were re-challenged with the intravenous injection of tumor cells . It was notable that the prior combination treatment inhibited the formation of measurable tumor mass . We proposed that STING agonist could boost the efficacy of CAR-T-induced in situ cancer vaccine and initiate durable systemic anti-tumor immune response.